Not in stock: Please call the store to order. Usually only takes a few days. Stop saying "adulting" -- and other life advice you didn't know you needed. But you do. It's no secret that being a grown-up can be hard. Most people spend a decade or more figuring out the unwritten rules of life through trial and error (mostly error). Perfect for anyone who's ready to graduate into adulthood, or at least out of their mom's basement. Andy Boyle is a writer, comedian and web developer. His work, including a viral piece about giving up drinking has been in Esquire, The Chicago Tribune, The Boston Globe, The St. Petersburg Times and The New York Times Regional Media Group, where his work was cited in the 2012 Pulitzer Prize for Breaking News. When he's not teaching a class in digital storytelling at Columbia College Chicago or working on screenplays, he performs comedy wherever he can, usually in venues that shouldn't allow comedy. He lives in Chicago with his way-too-fluffy cat Tiberius. 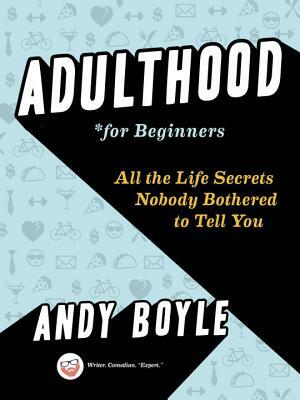 "Boyle’s book is hard to put down and full of solid advice. It’s the perfect gift for a high school or college graduate."